The Moon is in busy Virgo all day, and with Mercury and Mars moving towards an alignment, we’ll be especially motivated to get things done. However, we can be a little critical or insensitive in our communications now. The Moon is in Virgo all day (until Wednesday, May 27th, at 5:41 PM). The Moon is void from 10:21 PM forward (until 5:41 PM tomorrow). The Moon is waxing and in its First Quarter phase. Mercury is retrograde. (Mercury is retrograde from May 18 to June 11 in the sign of Gemini). You tend to speak with more passion today, Aries, and you may be very quick to communicate. Of course, hasty communications can sometimes be regrettable, so you may want to watch for that, but you may very well enjoy the ability to make quicker decisions or to handle a matter that you’ve put aside. Mental energy runs high today, and it should be kept in mind that people may not be saying what’s in their hearts. As such, it’s better to keep some emotional distance if engaging in debates. There can be many distractions, but this can be a great day for reviving an old mental interest or idea. While the Moon in your entertainment zone all day stimulates a desire/need to let loose your more playful side, Taurus, you can also feel quite motivated to put an idea into action, solve a problem, and get things done. This is especially the case with finances and business. Some of you could feel reason to defend yourself or come to the defense of someone. You are a little more impulsive than usual, and decisions can be made quickly, and ideally not hastily. This is a good time to revisit old ideas and perhaps update them. Review of past purchases or budgets can be fruitful. Mental energy is abundant today, and while it can sometimes cross over the line of excess, Gemini, you can get a lot done. The desire to build something for yourself or to take action on your ideas can be powerful now, and you are more willing to do what it takes to make things happen. You may want to watch for impulsive or unintentionally insensitive remarks, as your mind is working a lot faster than your heart, and at a quicker pace than that of most people around you. Of course, you can blurt something out and immediately prepare yourself for damage control. However, you may decide to consider consequences first and save yourself the trouble. This can be a day in which there is a lot of energy and animation surrounding a matter or a person from your past that has resurfaced, Cancer. You could find that you have more energy for putting something to rest, or for dealing with a nagging problem once and for all. A new piece of information, or a sudden memory, can make your mind race today, and there can be new insight into a matter. If you can harness the extra energy (mostly mental energy) you can be very productive today. There can be a desire to share something private or to release a mental burden, although you may want to doublecheck that you are not revealing something prematurely. Gather your facts before jumping into something. Others can notice you for your especially unique point of view or accurate observations today, Leo, and you can enjoy a nice feeling of invigoration and enthusiasm. Be aware that there can be a tendency to misconstrue or to put a lot of energy into something that you change your mind about later. As well, it can be especially important to pay attention to emotional cues and not only intellectual ones, and avoid taking others’ possibly insensitive commentary to heart as well. Otherwise, this can be an exciting day in which new visions and ideas are inspiring and light a fire under you. Conversations with friends or groups, and meetings in general tend to be animated and worthwhile. You’re communicating and coming across with considerable strength today, Virgo, with the Moon in your sign and your ruler, Mercury, approaching an alignment with Mars. What you communicate has more impact than usual, so be certain you know what you’re talking about! There is a tendency to live in the mind, so you may want to double check that your heart is behind what you’re expressing. You can be especially busy going over past work, researching ideas for future plans and goals, or doing editing activities. Try to balance logic and emotion. Be firm and true to yourself in your dealings with others today. This is a day of increased motivation and determination to get things done, or at the very least, to understand something more thoroughly, Libra. There is an extra dose of sharpness in your mental capacities now, and you’re inclined to look to the past to examine problems or put something to rest. Focus on tying up loose ends. You can be quick to debate or defend an opinion or cause today and tomorrow morning. Watch for too much living in the mind, however, as this can temporarily dull sensitivity to emotional cues. Be cautious about what you express, and if something said truly bothers you and causes your mind to race, try to wait before reacting, as the tendency to misinterpret runs high. You may be craving some alone or rest time today, and if you can take it, do so, with the Moon in your recuperative solar twelfth house all day. This is a good time to tackle projects or endeavors that you’ve let slide or that you’ve avoided in the past, Scorpio. There is mental courage today, more than usual, as well as a real desire to make things happen. Some of you could make an important discovery about finances or in a research project. There can be a competitive feeling today, and this can be used positively as motivation to make improvements. Restlessness might lead you to big discoveries, but it can also lead you down a frustrating path if you’re not careful. Focus on existing problems now for best results, rather than looking for new ones! Avoid pushing too hard for answers unless you’re prepared to truly get them. This is a strong day for review, research, and the revival of old interests or ideas. With Mercury and Mars coming to a conjunction in your partnership sector today, there can be an accelerated, energized pace to a relationship, Sagittarius. Impulsive communications are a tendency. Others may be reacting strongly or acting a little unpredictable. You may very well learn from the experience. You may be revisiting an old problem, and this time finding answers to it. An old relationship or significant person in your life can be in strong focus. Try not to be oversensitive to changes of plans or to others’ comments. Let others express themselves, but draw the line if you feel someone’s overstepping or too pushy with you. Channel the extra energy you have today into truly productive activities. An old problem or grievance, particularly work or health-related, can crop up today, demanding your attention, dear Capricorn. There can be a quickened pace to your routines and work, and to the day in general, and you can be filled with a sudden desire to get busy, to make a real difference, and to sort out problem areas. It’s a great time to find ways to reduce waste – you are especially resourceful and can easily get to the point or bottom line. Mental energy is strong today, and you are best off if you can use it to clear away clutter or otherwise clean up your life in little yet significant ways. Others may be falling behind you in terms of work or contributions, and it’s best not to worry too much about it. Also, watch for sharp words, whether you’re hearing or saying them. There is a business-like, slightly impatient quality to the day. There can be animation surrounding children, a romantic partner, a friend, or a creative project today, Aquarius, with Mars and retrograde Mercury meeting up in a sector of your chart that rules these matters. There may be surprises or excitement now, a desire to get to the bottom of a matter, and a need to solve a problem from the past. You can get very fired up about an interest or idea, and may be focused on past ideas, projects, or even people. It’s a strong day for feeling motivated to sort things out. For some of you, there can be an undeniable urge to express yourself in a creative, unique manner, and people tend to admire you for your ideas. As long as you avoid impulsive decisions or an overly competitive disposition, this can be a great day for increased motivation levels, making a real dent in your to-do list, and solving old problems. This can be a good day for picking up where you left off on an old project, Pisces, particularly around the home or with family. Something from the past might resurface, and it can be refreshing as you uncover needs that you have either denied in the past or simply overlooked. Home may not exactly be your haven today, as it’s likely to be quite busy and possibly hectic, and if you’re away from home, it may be that your own brain feels overloaded or especially excitable. Prepare for changes in plans and some level of restlessness, but also a real chance to get things done. Conversations can be lively. A partner may be taking the lead today or energizing and encouraging you. If Your Birthday is May 26th, If Today is Your Birthday full horoscope here. We crave organization and order, and are quickly disturbed by anything standing in the way of these things. This is a good time for chores, organizing, and tidying. It’s also a time for scheduling health appointments and checkups, starting new routines, and generally tending to details. We can be faced with confusing events, and we may not be seeing others clearly. People may be noncommittal, elusive, or absent when we need them. We are more vulnerable and sensitive. Moods are hard to define. Honor your need to feed your more refined or spiritual side, and the difficult feelings will soon fade away. We can overreact and exhibit impatience. However, this can also be a time of self-motivation. Our need for challenges and action is stimulated now, but we may not find the right outlets. We may not be communicating with sensitivity. What we communicate could misrepresent what we truly feel. There could be troubles with mechanics, computers, transportation, and miscommunications. We may not be understanding one another. We can be a little fickle and not especially objective. Think before you speak. Otherwise misunderstandings are likely to occur. Count to ten if you’re feeling annoyed. We are less inhibited and more willing to indulge ourselves. Love and romance can be favorable. Decorating, beauty treatments, the arts, creative pursuits, parties, dates, and recreation are generally favored now. Smile, laugh, and enjoy! Hurt feelings are opportunities for healing. Now is the time to build bridges rather than burning them. Meticulous, discriminating, pure, practical, health conscious, hard working. Can be hyper-critical, petty and perfectionistic. We tend to favor rational, objective thought over emotions, impulses, and feelings at this time. We are more intellectual, fair-minded, and logical in our approach, Ideas flow easily and quickly, we are more communicative and guided by principles, and also somewhat dispassionate or impersonal. We may be open to change but may not have much follow-through. We are flexible, adaptable, willing, open to change, and possibly flighty or nervous. Moon from 90 to 135 degrees ahead of the Sun. We are motivated to take action, perhaps due to a clash, conflict, or stress, as we are more aware of problems and differences now. Plans are beginning to take off or turn a corner. We should watch for pushing too hard. **I suggest paying close attention to applying aspects. The energy of the aspect builds as it gets closer to exact. Once an aspect has happened, it’s over. Separating aspects are good to know for context, but in terms of energy that is with us today, applying aspects are most important. (This is the case for daily astrology influences involving inner planets, which pass quickly, and not natal astrology aspects, which are with us for a life time). You will experience a strong link between the emotions and the body. You have a need for perfection. You may become ill when under stress. Your mother may be critical or a perfectionist. She will provide you with structure and order. You are indecisive, spending much time weighing up the pros and cons. This is because your feelings and thoughts are at odds. As you learn how to compromise you will develop understanding and an inner knowledge on how to act. You are quick-tempered and intolerant. Your impatience and irritability can mean periods of loneliness when others leave you alone. Once you have learnt self- control you will discover plenty of energy to be channelled into your activities. You are drawn to unusual people. Positively these people may be spiritual and artistic, or negatively they may be confused and drunk. You may idealise other people and need to be more realistic. The conflict is that you want to be at-one with the universe and yet cannot be until you have a clear idea of your identity. The lesson is to recognise your own artistic and spiritual potential. You are a powerful person with leadership skills. You are intense, quick to get to the point, and enjoy a challenge. You understand what motivates other people. Within you exists a deep emotional pain stemming originally from your relationship with your mother. You attract partners and situations which reflect that pain. It may be that your partner needs much caring or it may be that your partner sparks your wounds. The lesson is to face the pain and learn to balance your needs with the needs of others. You may then become a wise and loving healer. You are curious, communicative, versatile and talkative. You may be unreliable and evasive. Sabian Symbol: Drilling for oil. You are an effective communicator. You enjoy intellectual stimulation, and look for avenues through which to communicate your ideas. You tend to talk forcefully about yourself and your interests but are less interested in listening to others. You are hard working and energetic, and can be impulsive. You have a love of adventure, anything that provides an outlet for your boundless energy. You initiate, and take risks, at times acting too impulsively. You feel that forces are against you in life. You are always stopped from doing what you want. As a child, a father figure, may have been strict and imposing. As an adult you continue to feel this restrictions. You may also fear pushing beyond the restrictions. Your challenge is to create your own rules and beliefs on which to build your life. You are a sensitive and soft person apt to be overwhelmed by your empathy with suffering. You have martyr-like tendencies. You may be unsure of yourself and your own limitations and attributes. You also have creative and artistic leanings. You love conversation and information. You are a fast talker, who likes to collect and network knowledge and data. You enjoy books, letters, magazines, the media, computers and anything else that helps you learn and communicate. Sabian Symbol: A slave demands rights. You are a forthright and powerful speaker. You enjoy a thought-provoking discussion. You have difficulty using your powers of discrimination. Your own thoughts and opinions are vague and confused and difficult to pin down. You place emphasis on family relations. You will form strong emotional bonds within your own tribe. You may have an emotional need for financial security. Sabian Symbol: A prima donna singing. You are restless and lack commitment in your personal relationships. You are wilful and see anyone else’s claim on you as an obstacle to your freedom of self- expression. You need to learn to compromise and enjoy your partner’s unique contribution to your life. Drama plays a key role in your personal relationships. You are obsessed with the concept of love and desire and expect your loved ones to share your intensity. Your relationships are strewn with struggles for power and control, and possibly violence. You need to direct your energies into a demanding, creative pursuit. You are a gifted healer and a teacher. You have the voice of experience which gives you empathy with other people. You have a talent for seeing the beauty in your loved ones and helping them heal their psychological wounds and realise their full potential. You like to initiate ideas and spread information. You are assertive, although you can resort to evasive behaviour. Sabian Symbol: Newly opened lands offer virgin realms of experience. You have the ability to develop great creative power but you need to avoid drugs and alcohol. You may have allergies to drugs or have food intolerances. You are benevolent, generous and fun loving. You are on an enthusiastic search for creative expression. You may also have a love of children. Sabian Symbol: Sunshine just after a storm. You have an enormous ability and energy to achieve your goals. You set out to make changes in society and can do much. You avoid restriction and may live an unconventional life, breaking new ground in ways of living. You are enthusiastic about your ideals or your ideas. You will need to learn that others don’t always agree with you. They may not want you to help. They may not want to applaud your effort. You may be committed to higher education and have a strict moral code. You are also an easygoing and optimistic worker. (1928 – 1934) It is important to note that Uranus spends a long time in each sign, and therefore the interpretation applies to a generation rather than the individual. For a more individual interpretation look at the house position. This is the generation of initiative and spontaneity. It indicates the breaking down of old structures and the emerging of the new. Sabian Symbol: A young girl feeding birds in winter. Your generation works hard to use your power to right the wrongs you perceive in society. First you must learn to control that power in your own life. It is important to note that Neptune takes about 164 years to make a complete cycle, spending about thirteen years in each sign. Therefore the interpretation of Neptune in the Sign applies to a generation rather than the individual. For a more individual interpretation look at the house position. This generation may possess the ability to be at-one with God. They may be able to express their spirituality through visions and art. They may also be inspirational teachers, conscious of wholeness. Sabian Symbol: An aviator in the clouds. It is important to note that Pluto takes about 248 years to make a complete cycle, spending 12 to 32 years in each sign. Therefore the interpretation of Pluto in its sign applies to a generation rather than the individual. For a more individual interpretation look at the house position. This is the generation of a change in world government. This generation will posses the ability to transform old structures into new and enduring ones. Sabian Symbol: Boys and girls in gymnasium suits. You will have difficulty gaining your own sense of individuality. You have an ability to feel others’ pain and may need to detach and meditate. You may also suffer from your own deep and personal grief. You may work for or serve within a healing institution. Sabian Symbol: A man bringing down the new law from sinai. You work best when you are striving for service to humanity. You are committed to making the world a better place for everyone. You feel overwhelmed by work unless you focus on service to others. Sabian Symbol: A new moon that divides its influences. You possess the ability to see the big picture. You enjoy philosophical discussions and can include all cultures. You are a defender of truth. Sabian Symbol: A flag-bearer in a battle. You want to be proud of your partner, and for them to take pride in you. You want to have fun, romance, and creativity within your relationship. Sabian Symbol: A chemist conducts an experiment before his students. Your health may be closely linked to your home environment. Any disruptions in the home may spark bouts of ill health. You may be concerned for your family’s health. Sabian Symbol: Gondoliers in a serenade. You have difficulty making up your mind. You prefer to keep your options open and may miss opportunities to learn new ideas. Sabian Symbol: Santa clause filling stockings furtively. This is a quest to learn co-operation. You have a tendency to want your own way and to force your opinions onto others. You need to develop selflessness, the ability to share and a sensitivity to the needs of other people. Sabian Symbol: Three old masters hanging in an art gallery. Cnj 20°Cn27 CASTOR To write or create. Cnj 09°Li10 DIADEM To sacrifice oneself. 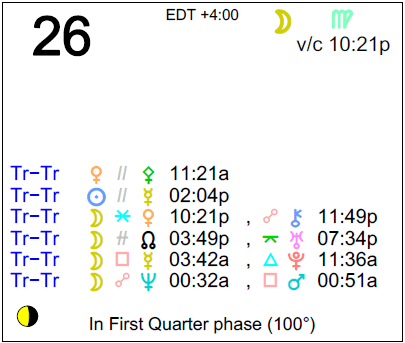 Sun 03° Taurus 56' 17"
Moon 05° Capricorn 46' 06"
Mercury 09° Aries 36' 27"
Venus 04° Aries 31' 28"
Mars 15° Gemini 53' 09"